Size 2 male die measures around .590 diameter. 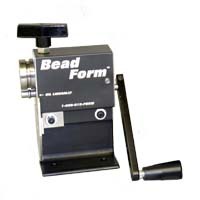 Quickly forms hose bead on tubing 3/4"- 4" O.D.Tubingr. Positive action gear driven. Vise mounted. Handles up to .065 wall thickness; copper, brass, aluminum and .030 annealed stainless steel tubing. Bead height of approx. .080" x .270 Wide. Includes carrying case.